It's been a few years coming, but I finally started the stream rebuild project a couple of weeks ago. It's been silent and dry (except for rain of course) since the winter, and I miss it! Remember that I thought of a plan that would involve less work? 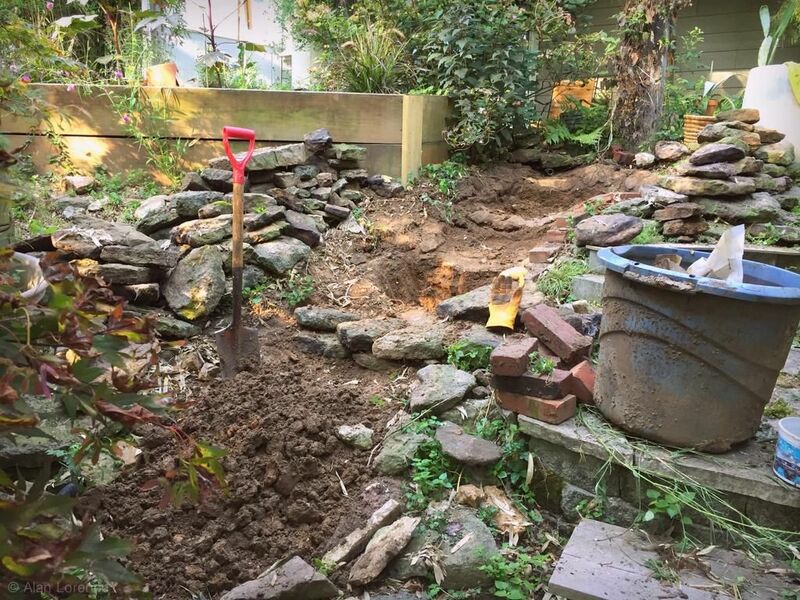 The demolition -- which involved moving lots of rocks -- was unavoidable regardless of the plan. It's also the brainless part, so thankfully it comes at the start because there were still a couple of details of the design I needed to clarify. When I removed the "cover rock" from the reservoir though, I got a little surprise. 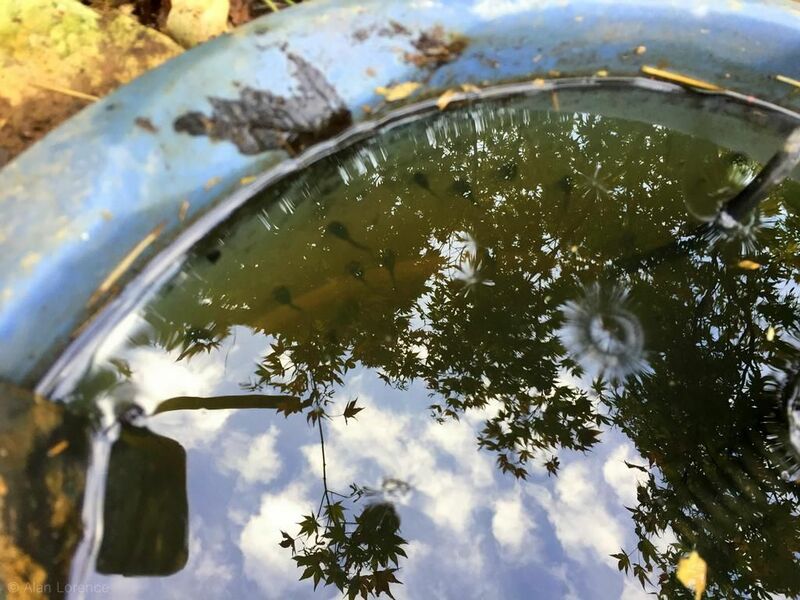 Tadpoles! 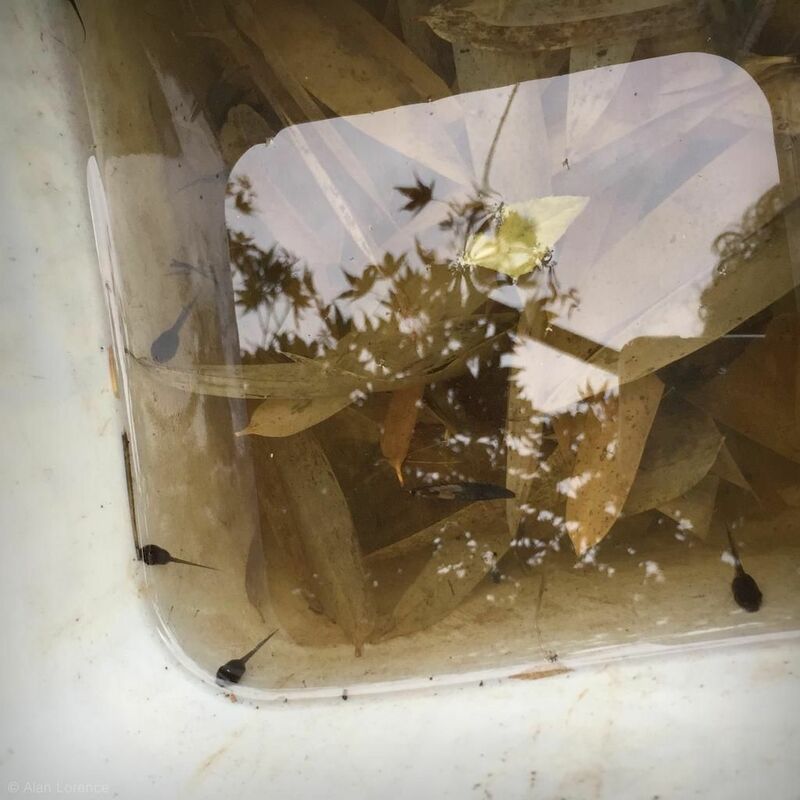 So instead of jumping right into the rock moving, I started a tadpole rescue mission. 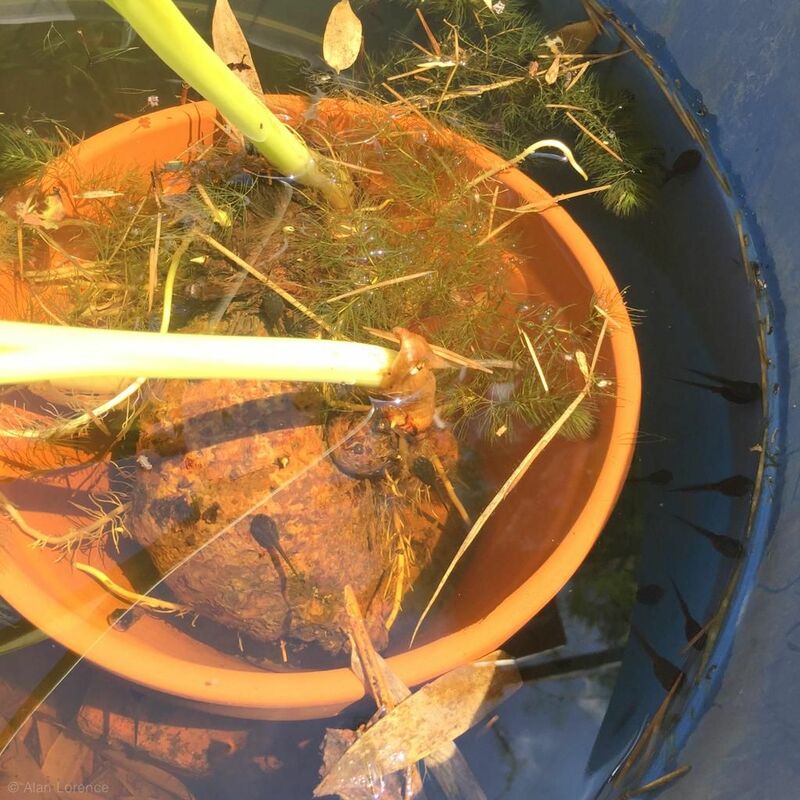 The water in there was surprisingly clear! 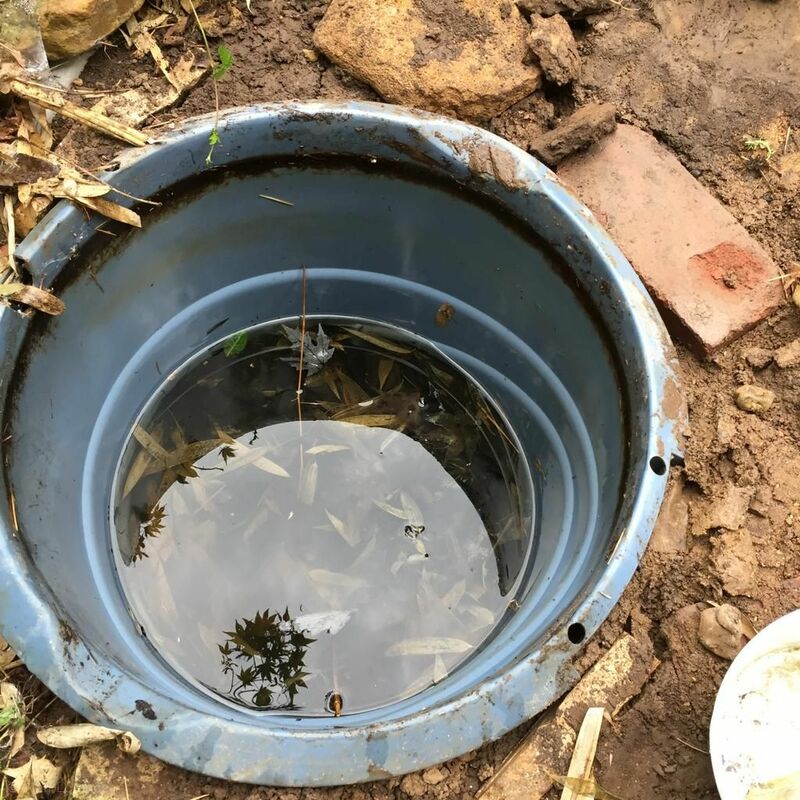 I had expected loads of the black, smelly muck (which is what I see early every spring) -- but there was only a little bit of that near the bottom. ...and gave them a new home which you'll see at the end of this post. That clay soil (and some sand) really grips on! This was surprisingly difficult to pull out. Back to moving rocks. I started off trying to keep them organized by size but realized that was not completely possible. At the end of that first day of work (July 15) there was a good amount of progress, and I was way past the point of no return. There were a few rocks that were falling to pieces at the top -- sandstone it seemed -- so those won't be reused. Everything else will be. The river gravel I just moved over to the south side of the house (to eventually wash down the hill I guess?) 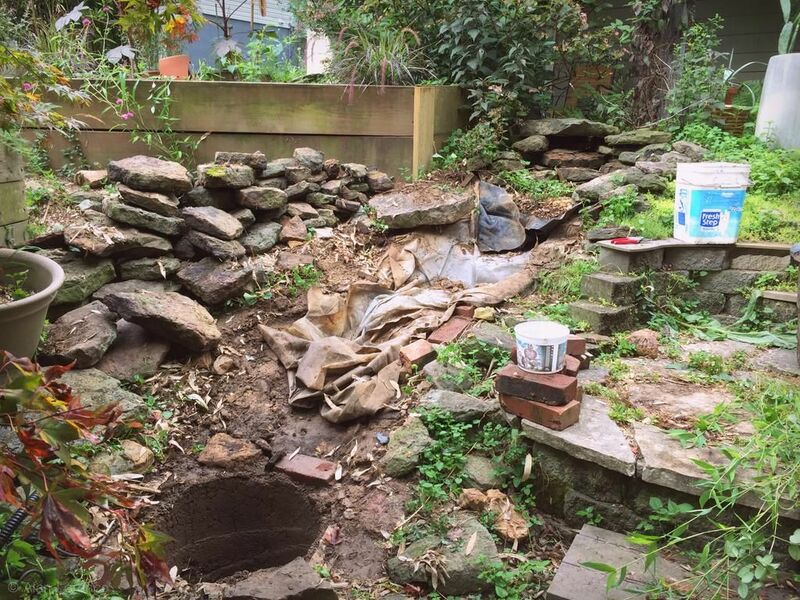 -- I'll start with new, clean gravel in the stream when I'm ready for it. So, this new design that involves less work -- want to know what it is? I can tell you the first part of it: making the stream shorter. That long run was too difficult to maintain, so smaller is better in this case! 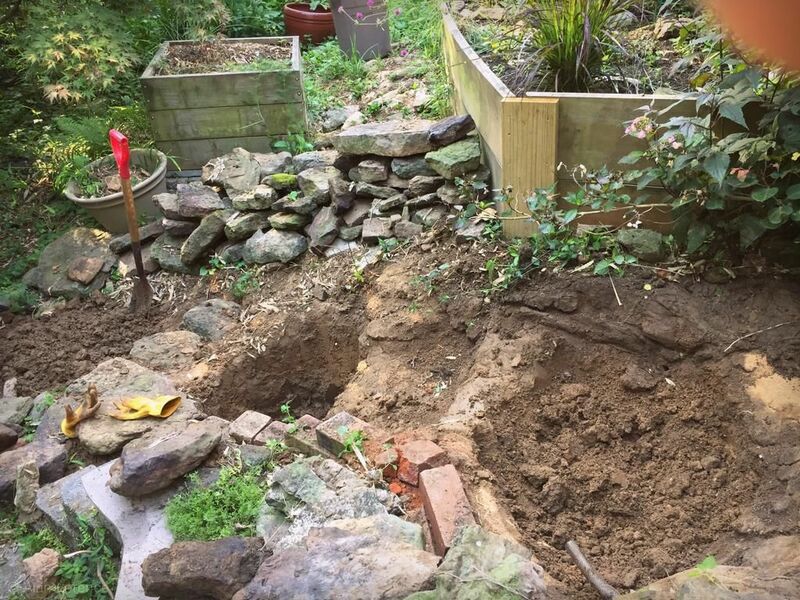 I put a little retaining wall of rocks at the bottom (the new bottom), and the old reservoir area will be a mix of rocks and plants. 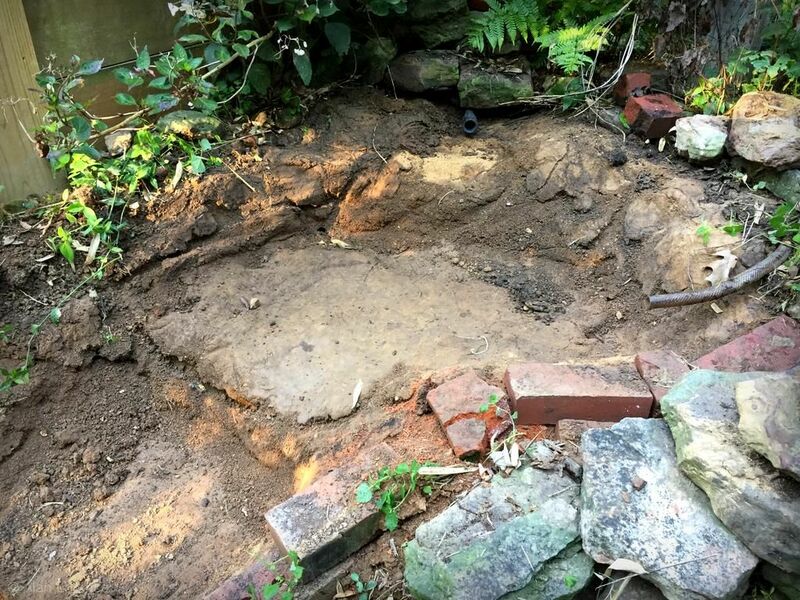 I dug the stream bed deeper too, as being too shallow was one of the problems with the first version. I'm excited about this! They're enjoying their first tastes of sunlight! 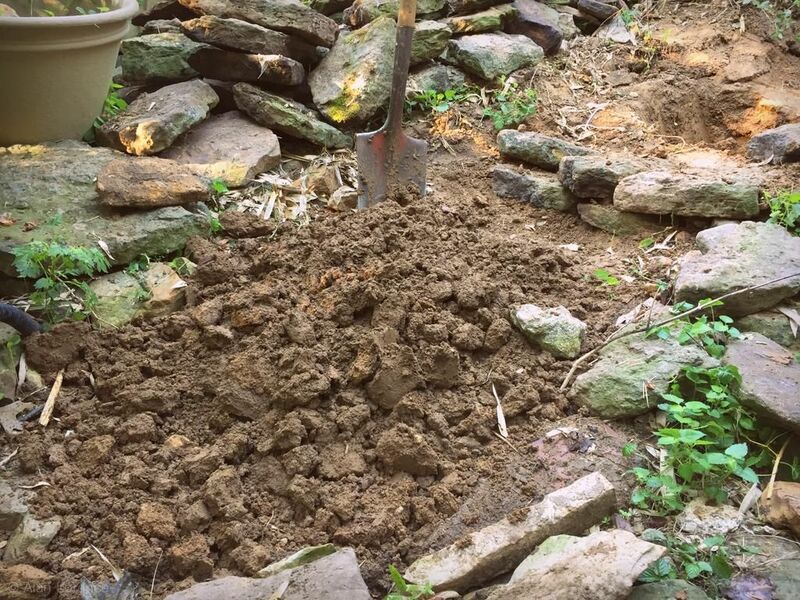 Lots of labor remaining, but working with rocks is fun for me! Ah! I've been waiting for this! Can't wait to see what's next! If you enjoy working with rocks, this must be lots of fun for you! 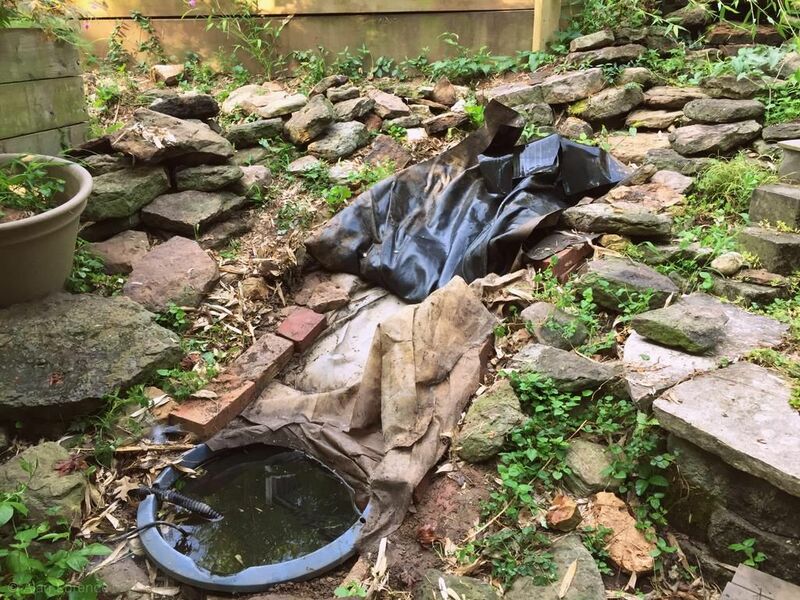 Your idea of making the stream bed shorter and therefore less work is great. 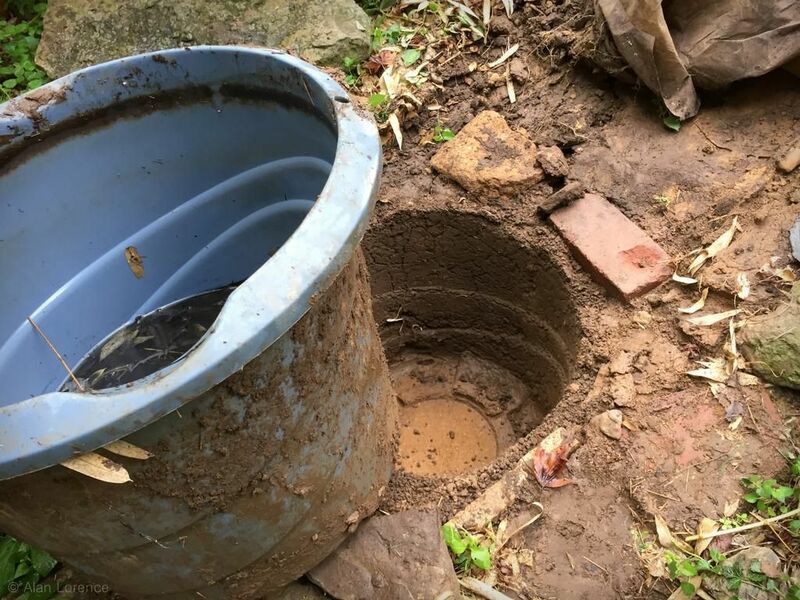 You'll feel wonderful when this is done and you, once again, hear the sound of running water in your garden! Yah, like Peter said, the sound of water running AND frogs croaking. 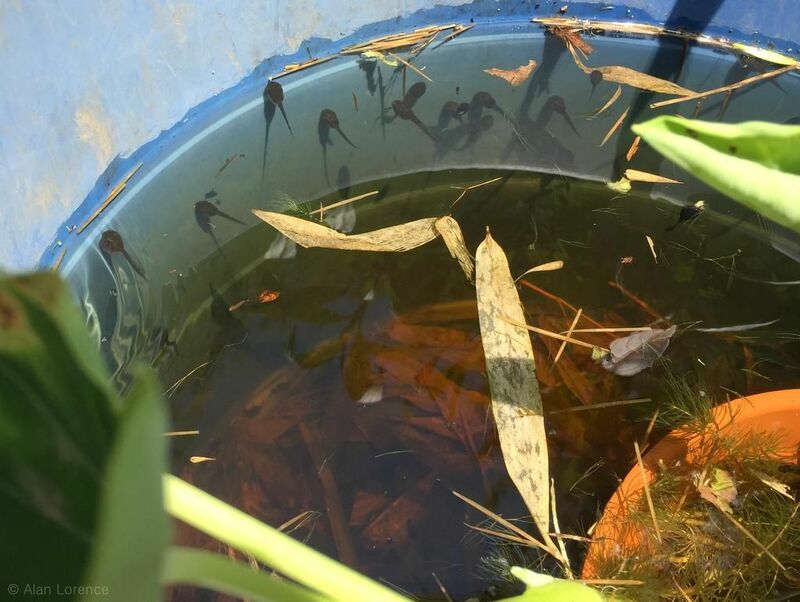 Would the tadpole be okay in the sun after hatching and growing in darkness? 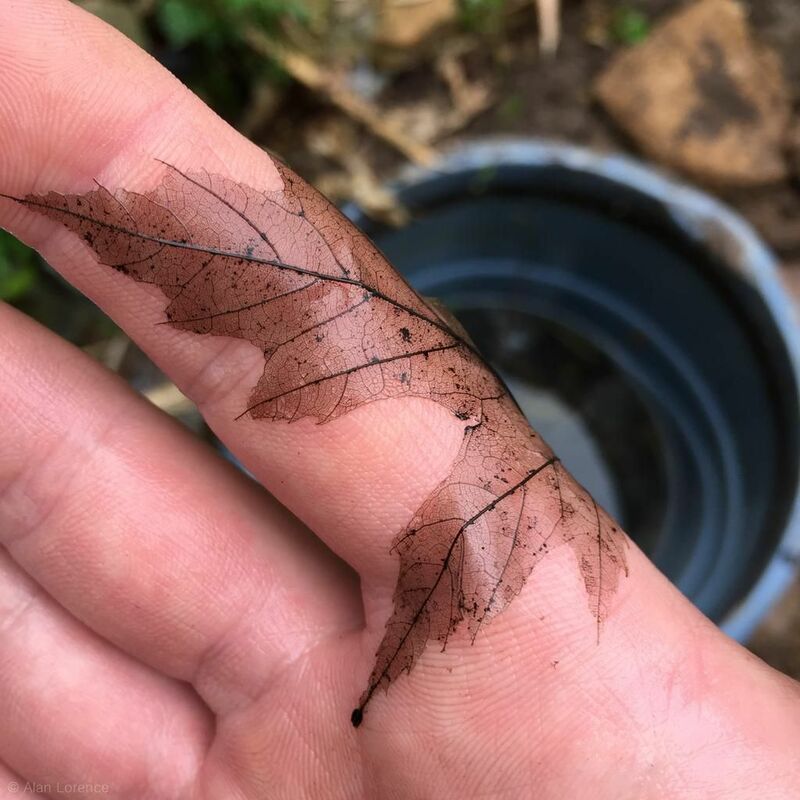 The decaying leaf on your hand is a good shot.